De button “New” is enabled. Click on it. 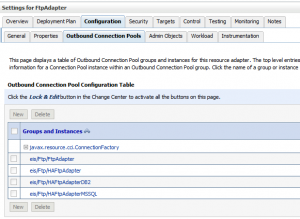 Click on the outbound connection you’ve just created, e.g. on eis/Ftp/TimeCardsSftp. We’re going the change some properties. Now press button “Save” to store these settings in the deployment plan of the FtpAdapter. The FtpAdapter has to be redeployed with these new settings. Go back to the list of “Deployments”. Do NOT click on the FtpAdapter, but select it! Hey,Ithink you’re doing here an authentification with password. So no need for generating public and private key. Is it possible without creating private and public key file? I mean we will just do a protocol switch by setting the parameter useSftp = true. We could see that we could write but not read.We were wondering why.